as edited by Everett and Sandra Truax. The death of Thura Truax Hires at age 69 in 1955 was noted in many places by citizens and organizations. She had lived a full and productive life, pursuing a wide variety of interests and providing leadership to many causes of lasting worth. Among those who placed in record their sentiments and the biography of Mrs. Hires was The Huguenot Society of Pennsylvania. One of Mrs. Hires’ peers and coworkers, Dr. Samuel Booth Sturgis, authored a most fitting tribute to her. This was published in the Society’s Proceedings in 1956 (Volume XXVII).Who was this Truax relative who gave so much to others? What inspired her? What kept her at the task? How did she accomplish so much? What was she like? Born in Minnesota, her grandfather, Daniel Van Der Heyden Truax, had migrated from Erie County, N.Y. in 1854, bringing his family. Daniel’s line came from Isaac Du Trieux b. 1642. His father had served with the “Green Mountain Boys,” and had fought in the battles of Bennington and Fort George. He was drowned in the St. Lawrence River in 1825. This Dakota pioneer’s son, Thura’s father, served in the Civil War, had been a businessman and railroader, and was elected as a circuit judge. He was Judge James Wright Truax. Thura was the last child of six. Thus, Thura’s birthright included awareness of, and devotion to heritage of family, and Country. Thura’s mother died when she was nine, and seven years later her father died. She then lived with her brother who owned a newspaper; Thura became its editor. She met her future husband, John Edgar Hires, son of the founder of Hires Root Beer, a young engineer who was working on an irrigation project on the Little Missouri River. They were married in Bryn Mawr, Pennsylvania in 1910. They raised their three children with love and affection. At this point, it is necessary to the story of Thura Truax Hires’ involvement with Truax genealogy, to bring others into the picture. David Truax was an actor from Chicago and interested in family history. During the 1870’s, he worked at the task. However, he became unemployed while in New York, and stored the trunk containing his manuscripts. When he sought to reclaim it, the trunk was gone, and with it was lost his family research. Theodore de T. Truax also lived during the post-Civil War era, this Theodore went to work on the same project. He was a New York Newspaperman, and had little money. He was unable to obtain financial assistance from prominent members of the family, and could not publish. He sold his manuscript to Grafton Press of New York City. Grafton Press, after failing to get the manuscript published, passed the work to the New York Genealogical and Biographical Society of New York. This, in edited version, was published as “The House of Truax” in 1926, 1927, and 1928. To Mr. Theodore de T. Truax, who died in 1915, a great debt is owed. Allan L. Truax, a citizen of Crosby, North Dakota, became interested in the Truax history in the 19th century and was to dedicate much of his life to this effort. In 1903, he established contact with Theodore de T. Truax of New York as he knew of the manuscript, and wrote to many Truaxes seeking help in bringing the work to light, and having it published. The life story of Allan Truax is itself most remarkable. Born in Michigan in 1872, he became a North Dakota School teacher. There, he married Evelyn Baldwin, a fellow teacher, and also born in 1872. Allan lived to be 93 and Evelyn lived longer. Allan spent most of his work life in the employ of the Great Northern Railway. He and his wife became well known for their civic and Church leadership. Allan developed great talent as a speaker and a writer. He was a second cousin of Thura Truax Hires. Following an accident which severed his arm, he retired from the railroad in 1933. He and his wife began a new life’s adventure. They bought a Model-T. Because of his handicap, he could not drive. She could. Together, they drove over 100 thousand miles, touring the country. They visited the 48 continental states in the process. Allan traveled to search for his family’s story, and to study America. He was greatly impressed in his visit to the Nation’s Capitol. He later produced a history of the Revolution in several volumes, and a series on the history of the states. This is to be found in the Institute of Regional Studies in Fargo, N.D.
Allan capped off his travels and studies at age 83. Alone, he went to England where he spent five months visiting the literary and historical treasures he had read about. By 1928, Thura was well into Truax genealogical research and many other far ranging pursuits-any one of which would have dominated the average persons life. It was in 1928 that she drafted her newly licensed high school student son, Charles Edgar Hires, as her driver. Edgar, now retired and the keeper of his mother’s journals, remembers waiting hour after hour outside homes as his mother examined family bibles, made genealogical notes, and interviewed old folks to draw out family lore. Young Edgar also dawdled away many hours beside cemeteries as Thura made her census, noting vital statistics, names, and epitaphs. Back home, she would transcribe her penciled note books into typewritten form. She viewed all Truax clans as her family. She searched widely and unselfishly. She traveled throughout the United States. She compiled a “directory” of living Truaxes, and related persons, in the early 1930’s. In one notebook, she identified over 4000 such persons, and listed them by community of residence, and by State. Thirty-four states, as well as the Canadian provinces Alberta, British Columbia, Manitoba, Ontario, Quebec, and Saskatchewan. Mrs. Hires’ goal, in concert with her co-worker, Allan Truax, was clear cut. She was going to verify and expand the work of Theodore de T. Truax, as edited and published under title of “House of Truax” by the New York Genealogical and Biographical Society in 1926, 1927 and 1928. And, it seems, she wanted to leave no one out of the story. This led her to England in search of ancestors of that culture. There, she associated with noted historian and genealogist Sir Anthony Wagner. Her curiosity led her into a search of the ancestry of Sir Winston Churchill. She traced him back to a gentleman in 1176 who had made a pilgrimage to the Holy Land. She was a sentimentalist of the constructive variety. She was considerate of others. Having grown up with people of the Blackfeet Indian Nation, she devoted her talents to raising funds to aid the Indians, and endlessly lobbied the Federal Government to’ improve health and housing conditions and to provide for good education of the Indian Children. At her home in Ardmore, Pennsylvania she carefully planned and planted a formal Iris garden which was most beautiful. For many years she failed to see the garden in bloom as she was elsewhere judging Iris gardens. In 1939 she moved to a historical farm in Chester County not far from the Valley Forge National Park. The home “Rehobeth” was said to have been the headquarters of General Greene while he was at Valley Forge. Here she brought her iris and started new gardens. She also had many other flowers such as peonies, lilacs, daffodils and day lilies. She planted a field of about two acres in iris seedlings and with plants sent her from other growers for trial. She did most of the work on these plants herself, working in the cool of the early morning and the early evening. She and her family had a home within two miles of the Valley Forge Park on land of Revolutionary note. Her son Edgar reports that three rooms were stacked with genealogical materials and notes. Thura did her own work, never employing genealogical services, or clerical help. Thura, being raised with animals such as fawns given to her by the Blackfeet Indians, loved animals. Once, at an auction, a broken down horse was about to be auctioned off to a glue factory buyer. Thura bought him, took him home, and named him “Frank,” after Franklin Delano Roosevelt. He lived for many years. At about the same time, she adopted a little pig which had fallen from a truck. He, too, lived to a grand old age. He and Frank were friends, and on hot summer days, he stood in Frank’s shadow to escape the sun. by Samuel Booth Sturgis, M.D., Honorary President of The Huguenot Society of Pennsylvania is reprinted with the permission of The Society. This tribute first appeared in the Society’s Proceedings in 1956, Volume XXVII. Mrs. John Edgar Hires, the former Thura Helen Colby Truax was born in Barnesville, Minnesota, 24 March 1886, the daughter of James Wright Truax and Rose Colby Truax. Philippe Truax, her paternal ancestor, on 9 March 1624, in Leyden, obtained a Certificate of Transfer “Pour Westinde,” and with his wife were among the thirty families to sail on the New Netherlands to become the founders of New York. Mrs. Hires was also descended from an illustrious line of Puritan ancestors. From the earliest periods of our colonial history, her ancestors were outstanding citizens and through them she inherited the right of membership to practically all of the presently existing societies requiring lineage background for membership. Mrs. Hires spent most of her early life in North Dakota. Her father was in the employ of the Northern Pacific Railroad and his duties required him to move westward from Barnesville to Hastings, Minnesota, then to Williston, North Dakota, where he took up residence in 1895 and where in 1898 he became a Circuit Judge of Williams County, North Dakota. From Williston the family next moved to Minot, North Dakota. In the latter town her brother, C. Frederick Truax published the town newspaper and Mrs. Hires was employed by him to edit the paper. It was in Minot, where Mrs. Hires met her future husband John Edgar Hires, a young engineer who had been sent west by the government on a project. They were married, 14 May 1910, took up residence in the Philadelphia area, and finally established their home on Linwood Avenue, Ardmore, Pennsylvania. From childhood, Mrs. Hires was an avid reader and possessed a love of history. As the Editor of her brother’s newspaper she developed early a keen interest in writing and in research. In Ardmore, during the period when her children were young, she directed her efforts to research in genealogy and, for a period of more than thirty years, applied herself not only to the genealogy of her own family but also to that of others who sought her advice and assistance. To friends she was always most generous with her time and knowledge. She was an indefatigable student and she has preserved for her family voluminous genealogical records of their forebears and the contributions they made to the development of our nation and of the countries of their origins. In the field of genealogy Mrs. Hires early received international recognition and although she was never a professional genealogist yet her services were sought widely. She compiled volumes of genealogical records for the National Society, Daughters of the American Colonists; The Daughters of The American Revolution; The Colonial Dames of America; The Colonial Daughters of the 17th Century; and the Society of Mayflower Descendants. Mrs. Hires possessed a keen sense of historical values which contributed to the proper preservation of materials and records which were destined for destruction amongst which should be noted valuable World War II records. In 1939 her services received special recognition when she was made a Fellow of The Institute of American Genealogy the highest honor one can obtain in this field. Mrs. Hires served with distinction in various capacities and offices in several of the lineal societies. As State Regent of The Pennsylvania Society, Daughters of the American Colonists, she contributed to the founding of seven chapters with large memberships. As National Registrar of The Daughters of the Barons of Runnemede she completed a monumental task in verifying American and English lines which necessitated months of travel in England and on the Continent in pursuit of data. Her work at the College of Arms of London received the commendation of the President of that august body. 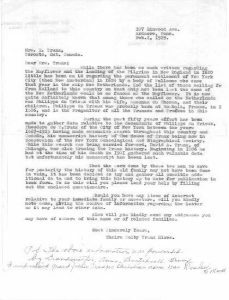 In the spring of 1955, The Daughters of the Barons of Runnemede, at their annual meeting, established The Thura Truax Hires Genealogical Fund in her honor. The recipient of a monetary gift from the State Chapters of the Society honoring the memory of Mrs. Hires, and donated through the efforts of The Wissahickon Chapter of which Mrs. Hires was Organizing Regent. The moneys will be applied for the preservation of genealogical data of the Society by microfilm. In recognition of her generous support of the scholarship program at Lincoln Memorial University in Harrogate, Tennessee, The Pennsylvania Chapter, Colonial Daughters of the 17th Century, gave a one-year scholarship in her memory. Among the various other memorials which have been given in her memory are books of reference to libraries and aids to scholarship funds in universities. Although possibly Mrs. Hires’ greatest interest was in genealogy yet she received recognition in other fields for her work and her knowledge. Mrs. Hires long championed the cause of the American Indians. For years in association with civic and historical Societies she worked tirelessly in presenting to the proper authorities of the government of the United States the sad plight of the Indians. She and her associates were responsible for the enactment of much legislation in behalf of the Indians. The human, understanding, and charitable sides of Mrs. Hires were always apparent during her entire life. The civic interests of Mrs. Hires were many and varied. She served with the American Red Cross in the First and Second World Wars. She was a member of The Civic Club of Philadelphia and for many years served on its Board of Directors. She was a Director of The Pennsylvania Parks Association and had the distinction, for a period of time, of being the only woman member of this Board. In the field of horticulture, Mrs. Hires made far-reaching contributions. She maintained, in gardens at her home, one of the finest collections of iris in the country. The writer recalls many visits to this garden when he was shown more than four hundred varieties of iris which were embraced in her collection. She was an authority on the propagation and culture of iris. She was a founder and life member of The American Iris Society and traveled widely throughout the country lecturing, examining, naming new varieties, and stimulating interest in this field. As a member of The Pennsylvania Parks Association she was especially diligent in the preservation of trees and our native flora. Mrs. Hires was one of those fine people to whom the majesty of all nature was a continuing inspiration and relevation. Nor was the life of Mrs. Hires so preoccupied with her numerous daily and vital duties but that time was not available for the enjoyment of a hobby. The busiest of people are those who always can find more time and effort for other pursuits. Over a period of many years, Mrs. Hires assembled an unique collection of dolls. She planned a collection that would be of historical importance and which would present a running history through the years. Her collection consisted of both antique and modern dolls and a complete library on the history of dolls. At her death the massive collection was bequeathed to The Chester County Historical Society in West Chester, Pennsylvania, where it has been permanently housed and placed on exhibit. Mrs. Hires held membership in many historical and civic societies. The following list is not a complete one: The Huguenot Society of Pennsylvania; The National Society of the Daughters of Runnemede; The Colonial Dames of America; The Daughters of the American Revolution; The Colonial Daughters of the 17th Century; The Daughters of the American Colonists; Descendants of the Ancient and Honorable Artillery Company; Society of the Daughters of Colonial Wars; The Daughters of Founders and Patriots of America; The Order of the Crown in America; Order of Americans of Armorial Ancestry; The New England Society; The Historical Society of Pennsylvania; The Civic Club of Philadelphia; The Pennsylvania Horticultural Society; The American Iris Society; and other societies. The writer has summarized briefly the good works and accomplishments of Mrs. Hires. But these do not reveal adequately the fundamental character or the guiding intelligence of this remarkable person. An association of more than thirty-five years permits the writer to define more clearly her values. Endowed by birth and by nature with gentleness and humility she lived a life which was always an inspiration to all who knew her. She was kind, patient, and charitable – always ready to lend a helping hand to those-who sought her out or to those who needed help. She did not question the reasons why but graciously shared her all. No one will ever know the number of children whom she educated or to whom she contributed generously to help in their educational programs. Her thoughts and energies were directed to where she could help others and do the most good for her fellowman – always self-sacrificing and self-effacing. Her good works were performed not with anticipation of personal gain or salutary rewards but with the desire to make this world a better place for all to appreciate and enjoy. Equipped with superior qualities of mind she did not stand idly or vainly but labored tirelessly to turn to proper account her inherent capacities. She believed in America and in the American Way of Life with equal opportunities for all, regardless of race, color, creed, or circumstance of birth. She did not aspire to heights amongst her fellowman et her good deeds and her exemplary Christian life place her before us as one who met life nobly and who has left to us the heritage of a life of usefulness, purposefulness, and accomplishments. Above all the fundamental character of Mrs. Hires was most apparent in her home. I shall remember her, in her home, as a lady of distinction with charm, dignity, and infinite patience and understanding. Her family came first in her life and all other interests were secondary. Training in her home was the best training for life that any child could have obtained. Mrs. Hires during her later years lived at her farm “Rehobeth” in Strafford, Pennsylvania. She died at the home of her daughter Mrs. Groff on, 7 October 1955. She is survived by a son Charles Edgar Hires of Bryn Mawr, Pennsylvania; by two daughters Mrs. Marshall Irwin Groff (Jacqueline Hires) of Bryn Mawr and Mrs. Lewis Lindenmuth Schock, Jr. (Thura Hires) of Falls Church, Virginia; and by five grandchildren all members of The Huguenot Society of Pennsylvania.